The national vacancy rate for multifamily remained moored at 4.4% in the third quarter, unchanged since the fourth quarter of 2015 despite the large number of new deliveries. This confirms what we have posited thus far about demand remaining robust even as supply growth increases. With that said, this equilibrium is tenuous and likely won’t last. For markets that experienced either a large increase in rents over the last few years, or a steady influx of new buildings – or both – landlord pricing power is being tested. Market conditions in the apartment market softened a bit in the third quarter, a period they generally see the highest activity and strongest rent growth. We started 2016 feeling fairly optimistic about the prospects of the office sector. With the national vacancy rate declining by 40 basis points last year, we were poised to finally see an acceleration in improvement in fundamentals for the office sector. With national vacancies remaining stuck at 16.0% in the third quarter, it appears that optimistic hopes about the prospects of the office sector have been put on hold – at least till the fourth quarter. While the numbers disappointed in the quarter, much of the decline was a lagged response to tepid employment and economic conditions in the first quarter. The national neighborhood and community center retail vacancy rate increased by 10 basis points during the third quarter to 10.0%; the retail mall vacancy rate decreased by 10 basis points to 7.8%. Both minor changes represent a reversal in the second quarter when the neighborhood and community center vacancy rate decreased and retail mall vacancy increased, both by 10 basis points. Neighborhood and community centers have lagged due to the slow growth in median household income that has kept a lid on discretionary spending over the last few years. Both neighborhood and community centers and regional malls face competition from newer and fresher retail concepts as well as e-commerce. The momentum in the industrial market slowed a bit as demand growth decelerated. Nevertheless, vacancy held steady in the warehouse and distribution sector as net absorption exceeded new construction by a small margin. Although the industrial sector has outperformed other property types in terms of occupancy growth, the down-shift observed in the third quarter puts the asset class on par with office and retail which followed a similar pattern. Echoing the sentiment we expressed last quarter, the slow but steady rate of growth should continue going forward as most metros continue to see demand growth for industrial space. Vacancy declined in the Flex/R&D subsector largely due to a sharp drop in new construction. Net absorption slowed somewhat but remained positive. Market rents increased but also at moderate rates, similar to the second quarter. Once again, every metro posted positive rent growth for the quarter, although some outperformed others. The third quarter of 2016 was marked by a somewhat consistent trend – a pronounced pullback in new completions, relative to recent quarters. This is readily apparent in the apartment and office sectors, but less so in neighborhood and community shopping centers where supply growth has been anemic for several years anyway. What caused this pullback – especially in multifamily where we were expecting a deluge in new supply? Any pickup in activity for new completions is likely to be driven by projects that are already in the pipeline, just waiting to come online in what may well be a deluge for the apartment sector in the fourth quarter. The mean retail cap rate decline by 30 basis points during the quarter to 7.2%. Despite this, the 12-month rolling cap rate was unchanged at 7.4%. This is the first time in about a year that the mean cap rate has fallen below the 12-month rolling cap rate, indicating some recent pricing momentum in the market and intimating that the 12-month rolling cap rate could be heading lower in the coming quarters. Moreover, the 12-month rolling cap rate remained roughly 70 basis points below the historical average of that metric. This is a bit wider than what we observed for apartment and office although it is roughly in line with the difference from the last two quarters. Over time, retail properties continue to get more expensive, with all of the aforementioned cap rate measures at or near post-recession lows. 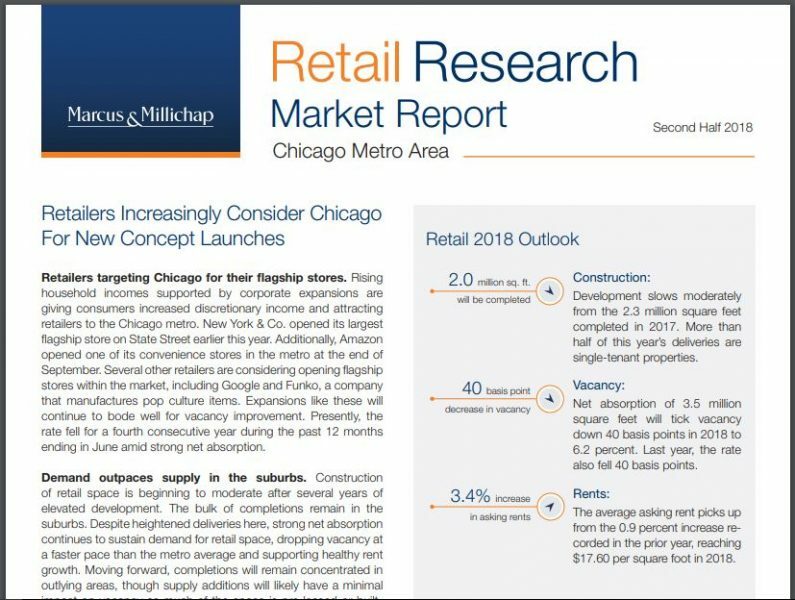 Ongoing improvements in the labor market and consumer spending are slowly translating into more demand for retail goods and space while supply growth remains muted. That doesn’t mean that this property sector isn’t without its challenges, but that despite the obvious headwinds investors are finding some value in retail centers. And this is an interesting point – vis-à-vis the other major property types, it is not a stretch to say that retail (in our case here neighborhood and community centers) faces the most serious structural challenges such as the inexorable rise of e-commerce and the proliferation of new retail subtypes complicates the landscape. Yet, investors are finding enough value that cap rates are at these levels today. Cap rates are a measure of a property’s investment potential, independent of the specific buyer. Investors, lenders, and appraisers use the current cap rate from Reis to estimate the appropriate purchase price for different types of income producing properties. To give our clients a complete picture of the income value of a specific property Reis evaluates three cap rates in our proformas, which are included in our sales comps, and can be seen in the cap rates proforma example above.